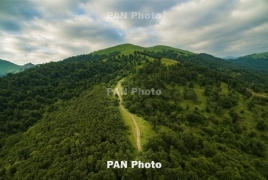 PanARMENIAN.Net - British 4x4 manufacturer, Land Rover, has recently announced that it will continue to provide support to the development of a hiking trail dubbed the Transcaucasian Trail - a 750 km prototype hiking route stretches the length of Armenia - the British Embassy in Armenia said in a Facebook post. A specially modified Land Rover Defender, one of the most adaptable and versatile 4x4s in the world, will be provided to the Transcaucasian Trail team to survey the route and to transport the equipment, materials and crew members needed to complete the work. The Defender, named "Georgina," has been specially modified to provide living facilities, GPS and communications technology, and enhanced off-road and recovery capabilities.